This is the motto of the Italian American Women of Iowa. They work to revive, promote and preserve the Italian heritage of its members. The club is made up of 97 women from ages 18-102 and give back to the community by volunteering or collecting items for other charitable organizations. The Italian Women of Iowa are excited to bring some Italian flair to Christkindlmarket Des Moines’ 2nd Annual Silent Tree Auction. If you are interested in bidding on their tree and supporting the work done by Italian American Women of Iowa, come to Christkindlmarket Des Moines 2017 December 1st-3rd. Veterans In Agriculture (VIA) are farmers, veterans, agri-business professional, educators, and other service providers dedicated to empowering veterans to thrive in Iowa agriculture. They provide three main programs/resources to help fulfill their mission statement: The Veterans in Agriculture Network, VIA Resource Guide, Rural America Hiring Heroes, and Find a Farmer Veteran. “Given the work VIA does helping returning military, this year the theme of our tree will be a reference to ‘all roads lead home,’” shares Grabau. They will also use red, silver, and blue ornaments and include “Welcome Home” ornaments featuring each branch of the military. Veterans In Agriculture are a returning participant to our Silent Tree Auction. Please come to Christkindlmarket Des Moines December 1st-3rd to make your bid and support this organization. For more information on Veterans In Agriculture, please visit their website. The Waukee High School German Department aids in creating well-rounded and cultured students. “We are dedicated to optimizing each individual’s learning and potential for success in a global community by providing students with opportunities to immerse in the culture and language of their choice of foreign language study,” explained Tia Anissa Pezzetti, a representative for the department. Come to the 2nd Annual Silent Tree Auction at Christkindlmarket Des Moines December 1st-3rd to bid on the Waukee High School German Department’s festive tree. One hundred percent of the proceeds from the auction goes back to the participating organizations. The Pet Project Midwest began in 2009 with a mission to keep pets in their loving homes and out of shelters. The run four main programs: Pet Pantry, AniMeals, Paws for Life, and Iowa Pet Alert. They are always looking for ways to add to their mission including: aiding people with veterinary care and assistance with spay/neuter. Unfortunately, current funding has prohibited this type of support. They are currently partnering with other animal organizations in the area to help families find assistance. “Because our mission is to keep families together, our tree theme will be the family,” said Hanlon. “We will incorporate all aspects of the family including those with fur, feathers or in some cases scales. To bid on this tree and support the work of The Pet Project Midwest, please visit our 2nd Annual Silent Tree Auction at Christkindlmarket Des Moines December 1st-3rd. For more information on The Pet Project Midwest, please visit their website. The Sons of Norway Marsteinen Lodge was started in 1984 to promote and preserve the heritage and culture of Norway. According to their mission statement, they celebrate relationships with other Nordic countries and provide quality insurance and financial products to members. They fulfill their mission “… by meeting monthly, with a program that highlights some aspect of Norwegian life and culture both past and present. Also, we eat a lot,” explained Wayne Almlie, current lodge president. The Sons of Norway are set to decorate their Christkindlmarket Silent Auction tree with a Norwegian theme, including: straw ornaments, Norwegian colors, Vikings, Nisse, and other decorations usually associated with Norway. If you are interested in bidding on this tree and supporting the Sons of Norway, come to Christkindlmarket Des Moines 2017 December 1st-3rd. For more information on the Sons of Norway Marsteinen Lodge, please visit their website. Are you on Instagram and Twitter? That’s a good thing, because we are now, too! Follow us @christmasdesmoines on Instagram and @christmasdsm on Twitter for all of the fun photos and up-to-date news on Christkindlmarket Des Moines. Des Moines European Heritage Association connects Iowans with European traditions, language education and cultural experiences; and it provides resources and tools to other cultural heritage organizations. Join us as we debut Confluence Brewing Company’s special Christkindlmarket spiced beer just in time for Christkindlmarket Des Moines 2017. $1 of every pint purchased will be donated to Des Moines European Heritage Association, the 501c3 non-profit that produces Christkindlmarket Des Moines. $2 off growler refills! Make a donation of $25 on site to reserve your Christkindlmarket Des Moines 2017 commemorative mug. Amana Woolen Mill, built in 1857, is the oldest business in the Colony and the only remaining Woolen Mill in the state of Iowa. Our textiles express the heritage, value and essence of the originating Amana community with timeless quality design and craftsmanship. We weave beautiful wool, cotton and recycled yarn products on our Sulzer looms in an array of widths ranging from crib-sized baby blankets to king-sized bed blankets. The weaving mill produces cloth for Amana Woolen Mill’s accessory department, where our talented seamstresses develop and hand-sew elegant home goods including table runners, placemats, napkins and pillows. Our line of personal items, consisting of large and small totes, cosmetic bags, wine totes and aprons, have received rave reviews for their beauty and quality craftsmanship. Christkindlmarket Des Moines would be a perfect fit for Amana Woolen Mill’s textiles. German culture and heritage is woven into everything we do. Our community was founded in 1855 by a small group of German immigrants seeking religious freedom. Its members lived simply, without vanity, and dedicated themselves to living sustainably. Through dedication to hard work, progress, and innovation, our businesses have operated continuously for more than 160 years. It may be a struggle to adapt our historic buildings in order to work efficiently, but we believe it’s the right thing to do. We’re constantly working to preserve the methods, talents and ideals passed down by our German forefathers and continue to produce a wide variety of heritage inspired, hand-crafted goods. We are thankful for the opportunity and excited to share these products with you. The Amana Woolen Mill will be bringing a variety of wool and cotton blankets a long with an array of accessories perfect for holiday gift giving. Our Wool Tartans, Houndstooth, Civil War Stripe and Alpine Blanket collections are classic patterns that fit and flow with the atmosphere of Christkindlmarket Des Moines. The Herringbone and Lily cotton throws are some of our most sought-after weaves. We plan on bringing our top selling colors to share. From the Accessories Department, the ever popular Doliver tote, made from recycled cotton and yarn with stunning leather handles and superb durability. Our small cosmetic/utility bags are always a hit. With a zipper closure to store smaller items and beautiful assortment of colors and weaves, these cute little bags won’t last long. We’ll be bringing a variety of 4-pack coaster sets (they make perfect stocking stuffers) and wine totes that pair perfectly with a couple bottles of vino and make a thoughtful gift for the host and hostess at holiday gatherings. Our cotton chef aprons are large enough to shield your holiday apparel from harm, yet stylish enough that you may not want to take it off before the festivities begin! With a generous front pocket and sturdy hand-sewn construction, these aprons make the perfect gift for anyone who loves to cook. Amana scarves are a practical and thoughtful gift for both men and women. Our line features a stunning assortment of colors and patterns sure to please even your most particular loved one. The scarves are weaved on our looms in both Merino wool and cotton yarns, then hand finished by our talented seamstresses. We have hand-selected beautiful wood cutting boards in a variety of species and shapes, classic rolling pins, and our ever-popular noodle cutters from The Amana Furniture Shop to round out our Christkindlemarket Des Moines collection. These products are well known for their superior quality and finish. Amana Furniture Craftsmen are both designers and builders, and put experience, passion and know-how into every piece they create. The Epilepsy Foundation of Iowa provides meaningful help to Iowan’s impacted with seizure disorders and epilepsy. The mission of the Epilepsy Foundation is to stop seizures and SUDEP, find a cure and overcome the challenges created by epilepsy through efforts including education, advocacy and research to accelerate ideas into therapies. The Epilepsy Foundation of Iowa will be using shades of purple, the Epilepsy Foundation’s color of epilepsy awareness, to trim their tree at the upcoming Christkindlmarket Des Moines’ 2nd annual Silent Tree Auction. If you are interested in bidding on this tree and supporting this organization, come to Christkindlmarket Des Moines 2017, December 1st-3rd. Click here for more information on the Epilepsy Foundation of Iowa. Creativity and exploration! It’s what being a kid is all about. 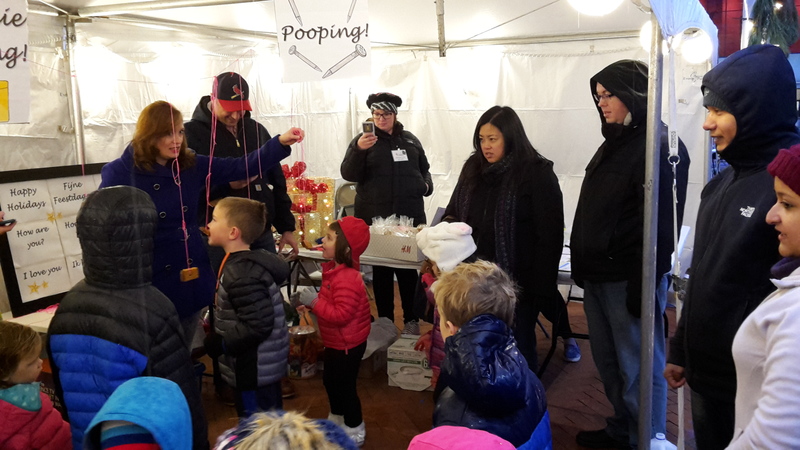 If you didn’t make it to the Christkindlemarket Des Moines (CDM) KinderKorner last year, you might not have noticed the many free activities we provided to those willing to spare a few minutes. There was activity in particular that we offered all weekend to encourage kids and their families to experience the event. Anyone that stopped by the KinderKorner was offered a CDM Passport. Though nowhere near as official as one you would use for international travel, it served to document young visitors’ progress in exploring the market. The passport outlined four tasks and upon completion of each, participants received a stamp. A completed passport earned them a prize from the Information Table. 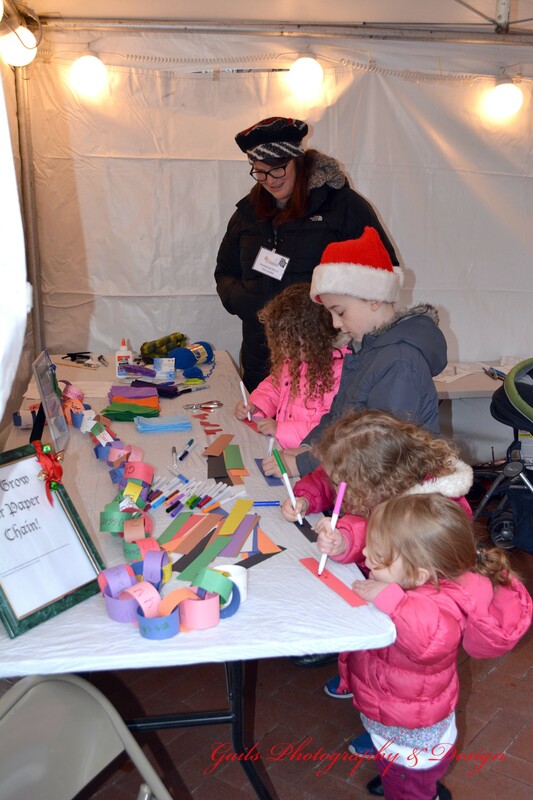 The first task was to add a link to our holiday paper chain, a tradition dating back to the 1900s. Next, our market explorers received a stamp for participating in a KinderKorner lead activity, like marking a felt ornament, coloring a picture or learning a seasonal song. The third task required venturing to the hand painted wooden Christkind and St. Nicholas photo cutout to have a picture taken with friends or family. The final stamp was awarded once our brave explorers gathered the courage to ask a question at the Information Table. Over the course of the event we had over 200 children take part, resulting in lots of smiles, loads of crafts and some legitimately interesting questions asked at the Information Table. For example, can YOU say “Happy Holidays” in six languages? If you are considering coming to Christkindlmarket Des Moines 2017, bring the kids! With all of our free performances and activities we are sure to keep you all entertained!